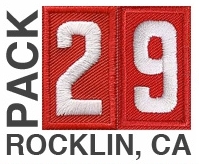 Rocklin Lions Pack 29 - Join Today! If you’d like to join our pack, have questions about the program or would like to attend a meeting to check us out, please contact us! 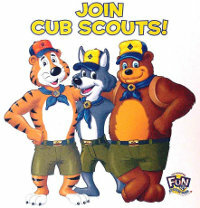 You are also welcome to attend our monthly Pack Meetings. They are typically on the 4th Wednesday of every month at 7 PM held in the Rocklin Community Center located at 5480 Fifth Street, Rocklin, CA 95677. See our Calendar for upcoming events! Build a Pinewood Derby car and race it on the track, build a sail boat or trimaran and race it in the raingutter regatta or build a space ship and race it to the stars in the pack space derby. Each time you complete an accomplishment or learn a new skill you will be rewarded. Sometimes the reward is a bead or a patch. Sometimes it is a smile on your parents face to see you grow and learn.